A new study finds that the nation's most affluent citizens are reducing their charitable contributions, while low- and middle-income people are donating more. As the Chronicle notes, lower and middle income people gave more despite watching their incomes decline from 2006 to 2012. By contrast, the wealthiest Americans saw their wealth and income soar in the recession's aftermath. 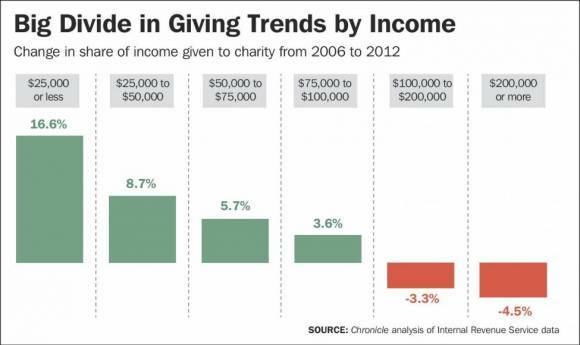 The latest study dovetails with previous findings about wealth and charitable giving. A 2012 study by the Chronicle showed that while middle income citizens gave 7.6 percent of their incomes to charity on average, the figure was just 2.8 percent for those earning more than $200,000 per year. The Chronicle's study also examined the types of charities different income groups support. Affluent givers are more likely to support hospitals and cultural institutions like museums, while lower income contributors tend to support social service agencies. Given that the 17 most generous states in the study all voted for Republican nominee Mitt Romney in 2012, conservatives may depict the giving gap as an ideological one. But research shows that wealthy people are more likely to be generous if they live among less affluent people. Democratic strongholds like New York City, Washington, D.C., and San Francisco, however, are among the most income-segregated cities in the country.